Russ Harbaugh and his wide receiving corps showed Albion what it had done all year in a 38-20 first round NCAA Division III football playoff win. The Little Giants will face Capital, a 21-19 winner over North Central, in the Nov. 26 second round action. More details on next week’s game will be announced Sunday. Wabash scored with long, efficient drives on its first two possessions to set the tone. The first score came after taking the opening kickoff. Harbaugh rolled to his right and found Eric Summers in the very corner of the end zone. "We had sort of a mix-up," Summers said. "I just sort of ran and saw a hole and Russ, like he always does, did a great job of finding me. He threw a touch pass and I was able to catch it. I think if there is one good thing that I do it’s that I’m very aware of where I am on football field. I’m usually pretty good at finding the sidelines and keeping my feet inbounds." Summers had another monster game with nine catches totaling 138 yards. Afterwards, even the Albion players marveled at Harbaugh’s accuracy and his fleet wide receiving corps. "He definitely got a jump on the game just completing ball after ball," said Padric Timmons, who led the Brits and all players with 16 tackles. "He was throwing short routes and it just seemed like we couldn’t get to it in time. We tried switching up coverages and keeping guys out, then pushing guys back out to the flats and it just seemed like he’d put the ball either inside us or outside us." Brit defensive back Tommy Lefere said Harbaugh kept Albion guessing. "We’d be jamming and it seems he’d just drop it right over our heads - right behind us or right in a pocket where we weren’t. We’ve played a couple of top offenses, but he’s definitely the top quarterback we’ve seen all year." Albion got on the board before the first quarter was over on a 15-yard pass from Steve Wasil to Troy Rundle. But Harbaugh found Ray Green, for the first of two scores, on a 15-yard scoring pass late in the second period to give the Little Giants a 21-6 halftime lead. "I wanted to play better than last week," Harbaugh said. "They played cover 3 and we thought that would be good for our quick game. We just came out to play. Our first two drives were huge and took off a lot of time." While the offense was providing the flash and the defense holding the Brit running game in check, the special teams provided the big emotional spark mid-way through the third quarter. Sophomore Richard Roomes recovered a blocked punt in the end zone to end any suspense, 31-6. "Robert Salinas, a freshman from Texas, made a beautiful move and got off the line right off the bat," Roomes said in a post-game press conference. "He had perfect hand placement for a blocked punt and I just happened to be in the right place at the right time." The defense wanted to limit Albion’s ground attack and did so with a stingy 41 yards. The defense’s toughness and offense’s efficiency made for a lopsided time-of-possession statistic. The Little Giants controlled the ball for nearly 38 minutes to Albion’s 22. 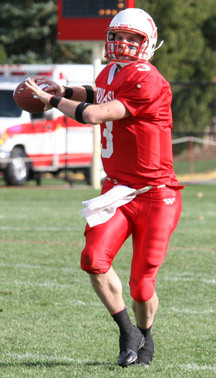 Wabash had 27 first downs to the Brits' 15. 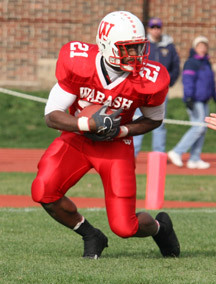 Senior linebacker Aaron Selby set the pace for Wabash with nine tackles. Seniors Tim Parker and Peter Kempf added six apiece. After Albion picked up its second score on a Wasil 8-yard run, Harbaugh answered right back with a 4-yarder to Green to open the final quarter. The dazzling passing numbers are the result of years of hard work, said Summers. "We’ve been playing together for four years, in the same system, same coaches, practice the same things," the senior receiver said. "It’s not just Russ and me but the offensive lineman, and we have a lot of seniors on this team especially on offense. I think we do have sort of a special bond out there. He knows where I’m going to be, and I know where he wants to throw the ball." Summers continued to heap the praise on Harbaugh, who would have none of it. "He throws a great ball and he makes it easy for us to catch it," Summers explained. "If the quarterback throws it in front of us so we can just go and get the ball that’s a great thing for us. That’s why his numbers are so good." "My numbers are so good because they’re awesome at making bad passes into good catches," Harbaugh countered. Coach Creighton said his quarterback and receiving group knows to take what’s given. "Russ does a great job of taking what people give him," Creighton said. "I think it’s a reflection too of him knowing how good our wide receivers are. Sometimes we throw for a lot of yards and we’re throwing a six-yard passes. But when No. 1 (Summers) has the ball in his hands the six yards can become 50 quickly." 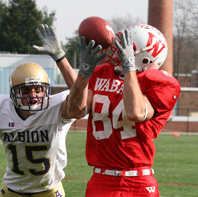 The Wabash coach, and former Kenyon College quarterback, also admitted he had a little envy. "I just saw Russ was 34 of 39," he said shaking his head. "I’m still waiting for someone to tell me that is incorrect - a typo or something. "34 of 39, I dreamed of that as a player every night before I went to bed but I never came close." Top right: Harbaugh rolls out to pass. At left: Roomes cradles the ball for a touchdown. Bottom right: Walker hauls in one of his six catches. On homepages: Eric Summers slices between Albion defenders. Or, Russ Harbaugh goes back to pass as Brian Hilts gives protection.